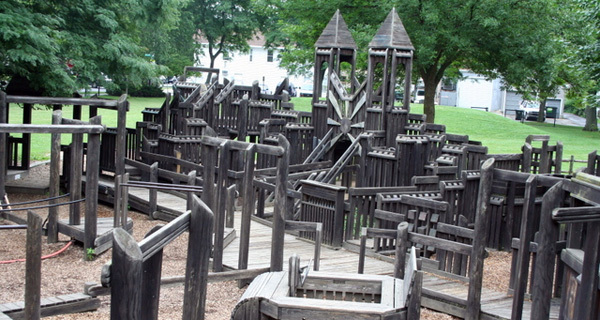 What is it about wooden playgrounds? In the age of plastic, maybe it's the novelty factor. Their muted tones and whimsical structures offer a refreshing respite from the bright colors and standard-issue equipment that dominate most playspaces today. Concord Township Park. 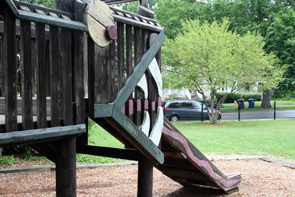 Glenn Mills, Pa.
Sherry Frick says, "No prefab commercially produced playground equipment here! 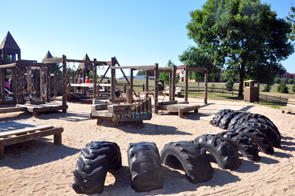 The entire HUGE area is built of wood and tires and has every possible playground element you can think of, plus more. From a distance it looks like a castle with many turrets. My boys said, "How come we don't have a playground like this back home?" Liza Sullivan says, "This is a truly magical, rich, and varied play space. As we approached the park, the children and I fell in awe of its uniqueness. 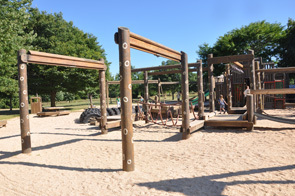 The majestic, wooden towering structures provided a treasured sensory experience (lacking in most play structures) – the feel, sound, and smell of the old wood inspired both imaginative qualities, as well as a clear integration with the surrounding natural elements. To me what was most captivating were the ubiquitous private places – the wooden narrow pathways, the underlying crawlspaces with hidden artwork, and the enclosed towers, all providing secret spaces for children to play." Discovery Playground. Tarpon Springs, Fla.
Tracey Quinn says, "In the theme of a castle, this playground features winding tunnels and stairs, numerous climbing and hanging activities, a tot lot and a tire swing. It is definitely a destination location for kids of all ages." 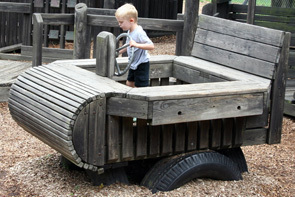 Any great wooden playgrounds in your area! Send us photos!